Own A Luxury Lifestyle Inspired by Royal Infra. Pune has long been a favourite destination for homeowners. If you are willing to buy a home in Pune, you may consider Royal Velstand to be your next destiny. Luxurious and elegant, the apartments will blow your mind. You can go for 2, 2.5 and 3 BHK apartments in this residential complex. The economic infrastructure of Pune has been fast developing over the years. The residents can enjoy a fast access to the key business zones from the residential complex. This high rise consists of 22 storeys and is located in Kharadi. Investors and homeowners from various parts of the country are interested in purchasing homes in this complex. The prices of properties in Pune are on the rise. As a result, these properties have good potential for revenue. You may get an apartment for yourself now and enjoy the enriched housing facilities here. You may visit the website to have a look at the Royal Velstand price. This is the right time for you to make the investment. The apartments are spacious and have large balconies, ensuring optimum ventilation. The sound floor plan and interior designs in the apartments are classy. Besides, the residents can enjoy a large number of amenities in the residential complex. These include mini theatre, swimming pool, gym and much more. Health and fitness enthusiasts can enjoy a good time in the complex. It also comes with a landscaped garden, where you can relax your mind and have a stroll during the leisure hours. The residents can soothe their eyes with the greenery around the complex. If you have a fascination for green living facilities, you can get an apartment in the residential complex. Apart from ensuring good ventilation in the apartments, wet garbage disposal facilities have been integrated into the complex. The estate has also got arrival plaza, internal roads, play areas for children and clubhouse, where you can find quality time during your leisure hours. The security backup in the complex is also of high quality. CCTV cameras keep a scrutiny on the common areas, apart from trained security guards. Besides, the complex has good firefighting equipment. One of the key advantages of buying an apartment in the residential complex is the proximity to the key commercial zones in the city. Important among these are the EON IT Park, WTC Tower, Cerebrum IT Park, Weikfield IT Park and Giga Space IT Park. Important schools in the area include The Bishops School, Podar International School, EuroKids, Dhole Patil College on Engineering, Kothari International School and Victoria Kids. The important shopping malls in the zone include Phoenix Market City, Seasons Mall and theAmanora Mall. Besides, a number of hospitals are located close to the complex prominent among which are Columbia Asia Hospital, Shree Hospital and Sahyadri Hospital. The airport is located just 7.2 Km. from the complex and you can get an easy access to the railway station, located 10.7 Km. away from the complex. 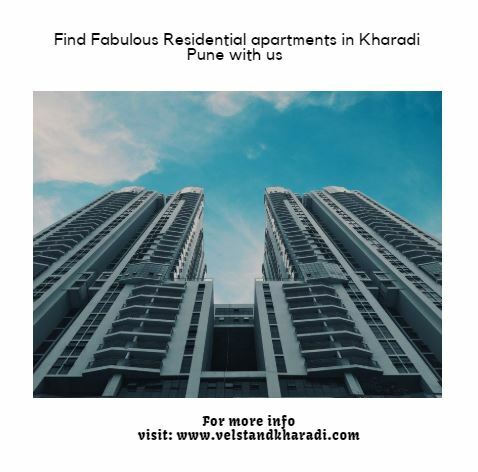 Homeowners interested in buying quality apartments inRoyal Velstand Kharadi should make their investment now. Tallest high rise the vicinity with access to natural ventilation, plenty of natural light and scenic views. Located in the upscale area of Kharadi. Luxurious and spacious homes, classy ambience and modern look of the building. 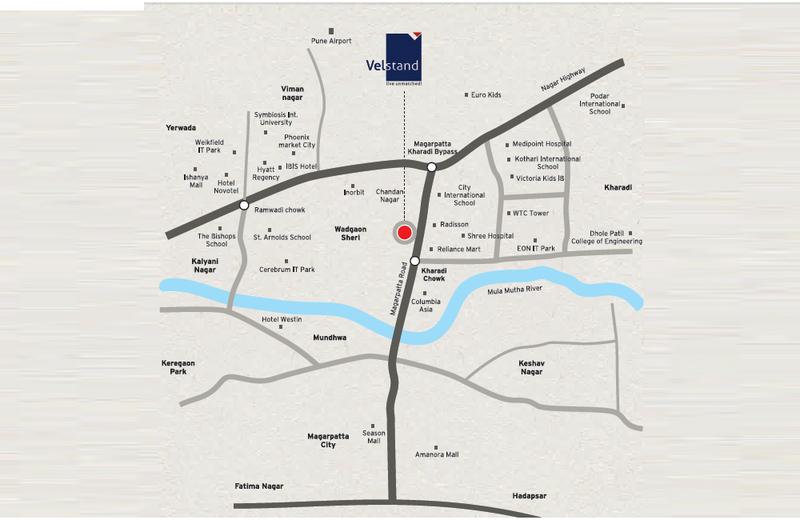 Easy access to topmost malls, IT Parks, schools and other places you love to visit. State of the art amenities and specifications for a comfortable life.